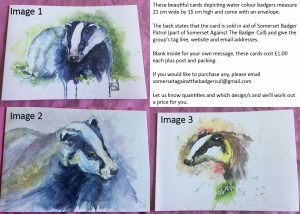 These beautiful cards (see below for prints) depicting water colour badgers measure 21 cm wide by 15 cm high and come with an envelope. The back states that the card is sold in aid of Somerset Badger Patrol (part of Somerset Against The Badger Cull) and give the group’s tag line, website and email addresses. Blank inside for your own message, these cards cost £1.00 each plus post and packing. Let us know quantities and which design/s and we’ll work out a price for you. We also have prints of Image 1. These measure approximately 34cm wide by 22 cm high and cost £10 each, plus post and packing. All profits from the sale of this print go to Somerset Against The Badger Cull to use for the protection of local badgers. Can I pay with a credit or debit card? – Yes. We will work out the price for you and when you’re happy, we will issue you with an invoice that can be paid online by card. How will the item/s be sent? – The cards will be sent in a board backed envelope of bubble envelope to ensure that they reach you in perfect condition! Prints will be send in board backed envelopes or postal tubes. Keep up to date. Subscribe to our newsletter. If you're unable to join us in the field, you might like to make a donation instead. All donations will be put to good use for the benefit of Somerset's badgers. Somerset Against The Badger Cull shared a post. We joined Hawkwind yesterday for a psychedelic Sunday in Frome, raising awareness for animal causes. Thank you to everyone who came to our stall to hear about the inhumane, ineffective and unscientific badger cull and for your kind donations too. Also a big thanks to Hawkwind for doing a song about the badger people! We continue to stand up for badgers, conservation and science here in Somerset. On a rare day off for a few of our most experienced sett surveyors, it appears that there is no such thing as a 'day off'! Whilst enjoying a walk at a popular tourist destination, runs were spotted and off they went! ALL DATA is important, no matter where you are! If you're out for a walk this weekend in Somerset and you know of a sett location, drop by and check it as setts are persecuted all year round and if fox dens are also in the vicinity, check them too. This time last year a large sett complex which was shared by both foxes and badgers was targeted by baiters OR for fox cubs to be used in training up hounds ahead of the next hunting season. Last year, this sett was targeted near Nether Stowey. Three months later the same people tried to return only to be chased away and their descriptions reported to police. 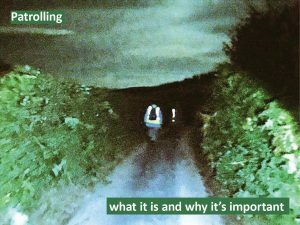 Next month we’re going to put a spotlight on the villages around the Somerset cull zones, that are and will be involved in killing badgers. Today one of our surveyors returned to an area near Wells that had been culled for the first time last year. Half-way through the cull, all three setts looked as active as they did before the cull started. Today, two of the setts were definitely less active with far fewer holes being used and several holes almost full of earth and debris. To add insult to injury, in one case, cows had almost obliterated any trace of what had, only a few months ago, been the homes of happy, busy badgers. And this sett had first been recorded in 1991. Some farmers want to obliterate all trace of badgers from our landscape. This should make every one of us furious and we should turn our anger into positive action. Sett surveying is vital otherwise we will never know what has been lost and what has been saved. The more of us that get involved, the more effective we will be. Get in touch now...we need drivers, sett surveyors and letter-writers. Training and advice will be given. To end on a positive note, one sett was thriving with lots of fresh digging and very well-used holes linking the entrances together. This is what we want ... and the more of us out there checking, the merrier! When you're out all day surveying, we always take a packed lunch and find a nice spot to sit and eat it in. The weather has been kind this last week and many miles have been covered, setts mapped and recorded. (Some of this information can and is used when planning applications are put in). The work we all do helps protect badgers across the board. If you'd like to join us, we can arrange to meet up and help you get started.